John Winston Ono Lennon, MBE (born John Winston Lennon; 9 October 1940 – 8 December 1980) wis an Inglis sangster an sangwriter wha co-foondit the Beatles, the maist commercially successfu an muisically influential baund in the history o popular muisic. He an fellae member Paul McCartney formed a much-celebratit sangwritin pairtnership. Born an raised in Liverpool, Lennon became involved in the skiffle craze as a teenager; his first baund, the Quarrymen, first became the Siller Beatles, an finally, evolved intae the Beatles in 1960. 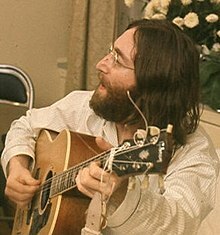 When the group disbaundit in 1970, Lennon embarked on a sporadic solo career that produced albums includin John Lennon/Plastic Ono Band an Imagine, an sangs sic as "Give Peace a Chance", "Working Class Hero", an "Imagine". Efter his marriage tae Yoko Ono in 1969, he addit "Ono" as ane o his middle names. Lennon disengaged himsel frae the muisic business in 1975 tae raise his infant son Sean, but re-emerged wi Ono in 1980 wi the new album Double Fantasy. He wis murthert three weeks efter its release. Lennon revealed a rebellious naitur an acerbic wit in his muisic, writin, drawins, on film an in interviews. Controversial throu his poleetical an peace activism, he muived tae Manhattan in 1971, whaur his creeticism the Vietnam War resultit in a lenthy attempt bi Richard Nixon's admeenistration tae deport him, while some o his sangs war adoptit as anthems bi the anti-war muivement an the lairger countercultur. Bi 2012, Lennon's solo album sales in the Unitit States exceedit 14 million an, as writer, co-writer, or performer, he is responsible for 25 nummer-ane singles on the US Hot 100 chairt. In 2002, a BBC poll on the 100 Greatest Britons votit him aicht and, in 2008, Rolling Stone ranked him the fift-greatest sangster o aw time. He wis posthumously inductit intae the Songwriters Hall of Fame in 1987, an intae the Rock and Roll Hall of Fame twice, in 1988 as a member o the Beatles an in 1994 as a solo airtist. ↑ "Lennon's 70th birthday". Rock and Roll Hall of Fame. Retrieved 8 October 2010.